A postprocessing tool for analysing particle data. fstatistics is a postprocessing tool: it takes an existing data set, consisting of a restart and one or more data and fstat files, and applies the coarse-graining formulations to it. The output is stored in a stat file, which can then be read by gnuplot or Matlab (via the loadstatistics.m file in Source/Matlab/thomas/) to be visualised. This document details how to use fstatistics as a post-processing tool for coarse-graining. It can also be used as a live tool, analysis the data while the simulation is still running, you have to use statistics_while_running.cpp. First, we provide the basic functionality, then show some examples, then the more complex operations are introduced. For simplicity, I assumed here that the data files are in the folder Build/Drivers/MercuryCG/. If the data is in another folder, then you have to use the command ./fstatistics $dir/filename, where $dir is the name of the directory. 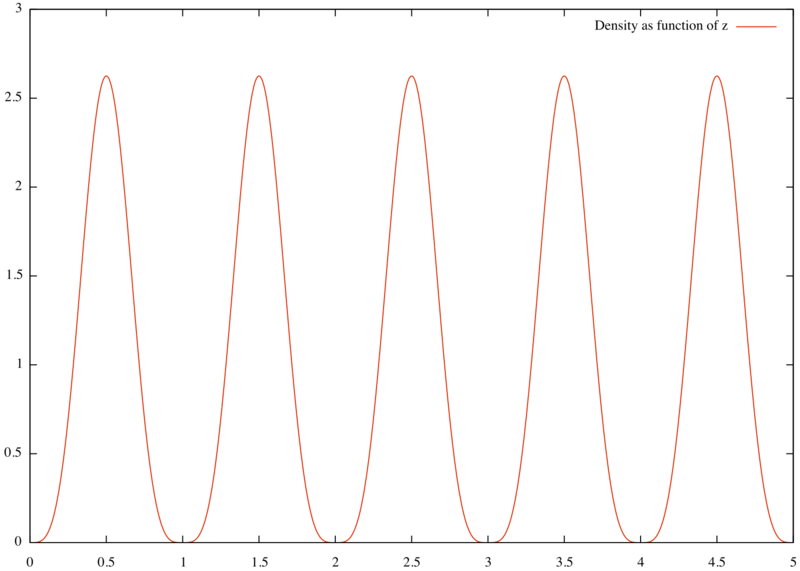 By default, fstatistics outputs the time- and space-averaged values of several continuum fields (density, momentum, stress, and a couple more). This output is shown in the command window, as well as stored in the output file named filename.stat. You can see that the volume fraction is 0.523599, the density is 1 mass/length^3, while the momentum nearly vanishes, which agrees with the simulation data. The first line details the different fields that are computed by fstatistics, e.g. volume fraction Nu, bulk density Density and the three momentum components MomentumX MomentumY MomentumZ. The second line details the coarse-graining parameters, mainly the spatial coarse-graining width w.
The third line shows the time step (or time intervall at which the data is taken); in this case, the data is time averaged from t=0 to t=8. The remaining lines contains the coordinate of a point and the values of the continuum fields at that point (in the order specified in line 1, so colume 1-3 is the point's coordinate, column 4 is volume fraction, column 5 density, column 6-8 momentum). For globally averaged values, there is only one line of data, with the point's coordinate set to the middle of the domain. However, fstatistics can do much more than return global averages of the continuum fields. In the following, several commonally used options are discussed. By default, the code uses the radius of the first particle in the restart file as the coarse-graining width, and a cut-off Gaussian coarse-graining kernel. Use the commands -cgtype [Gaussian,Lucy,Heaviside] and -w [double] to change these defaults, e.g. creates 3D fields (not very sensible for this example) evaluation on a grid which is 10 by 2 by 2. When generating multi-dimensional data -n uses a uniform grid. -w_over_rmax [double]: Set the averaging width in multiples of the radius of the largest particle in the restart file. -nx [integer], -ny [integer], -nz [integer]: Specifies the amount of grid points in a specific coordinate direction; use -n [integer] to set all 3 directions at once. -h [double], -hx [double], -hy [double], -hz [double]: Alternatively to setting the amount of grid points with -n, one can also specify the mesh size instead. E.g. for a domain of width 3, -h 0.01 is equivalent to setting -n 300. Use -h to set the mesh size of all 3 directions at once, -hx, -hy or -hz to specify the mesh size in a specific coordinate direction. -indSpecies [integer]: Evaluates only data pertaining to a particular Species. Useful for the coarse-graining of mixtures. -rmin [double], -rmax [Mdouble]: Evaluates only data pertaining to particles above or below the specified radius, respectively. -hmax [double]: Evaluates only data pertaining to particles below the specified height. -stepsize [integer]: Evaluates only ever n-th time step. Useful to reduce the amount of computational effort. -timevariance [bool]: Prints the time variance; only for time averaged data.